The most keenly awaited event in the world of furniture is here. ISaloni returns to Milan, from 17 to 22 April, to present the latest in the universe of the interior design. An event that is a true reference for creative minds all over the globe. Once again, Circu is presenting, at Hall 1 | Stand L09, to spread some magic at the event to present the latest trends. Every year, Circu commits itself to bring novelties to this recognized space…and 2018 is no exception. Kings & Queens Castle, Booboo Swing Sofa, Illusion Collection and the new Animal Stools, are some of the proposals that are stealing the show’s attention. Come pay us a visit during the Isaloni 2018! 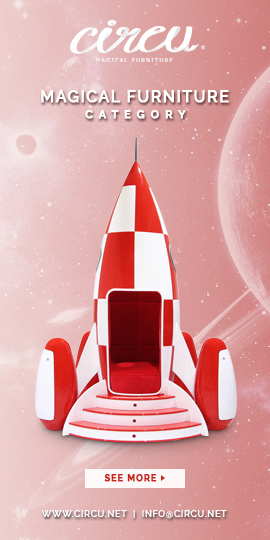 Circu’s presenting some of the most incredible bed design for kids bedrooms. If you want your kids to feel like they’re true royalty, then come check out the Kings and Queens Castle bed! Available in gold, silver and copper finishing, this incredible design can easily be adapted to the child’s gender. To get our kids the perfect sitting area for their room could be a tremendous challenge. We have to think about their size, their comfort and, obviously, the design of the room. Well, Fortunately for us, Circu’s designers are always there to deliver. The Illusion Collection defies your usual drawing table and chairs, looking like they’re floating in the air. Available in Polar bear or leopard print finish (in faux fur), your kids will feel as connected as ever to the wildlife. And, speaking of wildlife, why don’t you come over and meet the animal stools? With pink, green and blue velvet upholstery and a minimalistic design, these stools are perfect for developing the love and awareness for animals. Mirror mirror on the wall, who’s the fairest of them all? This amazing design piece will be featured on the stand’s walls, and you can check out its awesome 22” TV screen. What more can you wish for in a mirror?